Recently, advanced network computing systems have been realized as various sorts of computers and resources are connected with each other, owing to prosperity of large-scale networks represented by Internet. In such an environment, resources of network computing, i.e. computers, storage, and mobile terminals should be deployed more efficiently, conveniently, and securely. In our laboratory, we are focusing on a next generation network infrastructure and advanced applications, developing software (middleware) to support them. 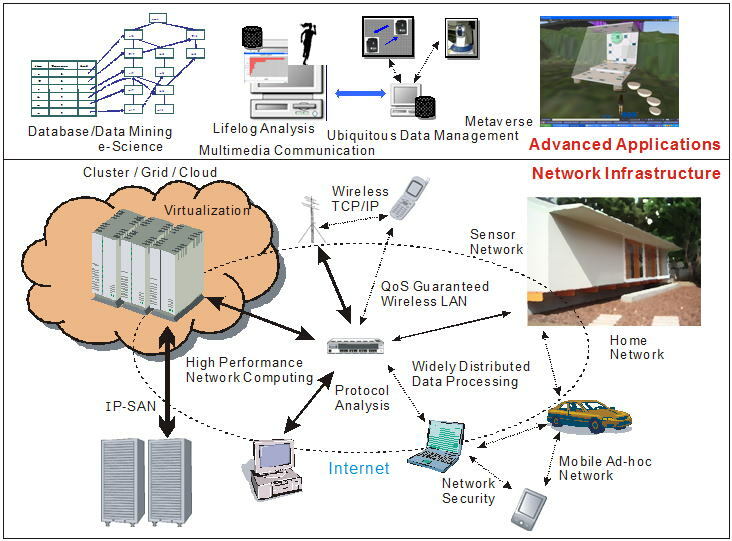 The above figure shows an overview of the latest large-scale distributed network computing environment, in which various kinds of computers and equipment are connected in a complicated manner. This behaves as if it were a huge computer system, which executes advanced applications with its high-performance calculation ability and data processing power. A typical form of network computing is a client-server model. As a network becomes complicated and huge on its scale, both a server-side and a client-side are required to be advanced types. On the server-side, for example, Cluster systems become huge in some cases, Grid computing is introduced to have a connection with other sites, and Cloud computing which regards its resource as a service is realized making use of a virtualization technique. One of the critical issues in this case is how a mass volume of data can be processed efficiently, because we are in the midst of so-called information-explosion age. For this purpose, new technologies of storage, file systems, and Storage Area Network (SAN) are developed. On the client-side, wireless networks become much more important than previously. Nowadays, wide variety of electronics devices have a power of small computers, and they are connected to a network with its communication interface. Although wireless communications are used often in such a case, bandwidth is limited and the quality is low in the case of wireless communications. Therefore, higher throughput and guaranteed QoS are desired in this environment. In our laboratory, we are focusing on important and interesting areas for research themes in an advanced network computing environment. Therefore, the research areas range from high-performance computing in the server-side to mobile networks in the client-side. In addition, while various advanced applications are focused on, network protocols and operating systems might be analyzed deeply, if necessary. Thus we have a relation with a various research field. We intend to develope next generation infrastructure and advanced applications.